Women's education is the key to human progress. A child whose mother can read is 50% more likely to survive past the age of five. As female education rises, the number of child brides drops. When women earn income, they reinvest 90% of it into their families. These and many more reasons inspired the creation of Asian University for Women (AUW), a liberal arts university in Bangladesh which aims to educate Asia's women to become leaders and promoters of sustainable human and economic development. Far from suburban shopping malls and Parisian catwalks are cotton fields, textile mills, and garment factories. Bangladesh has nearly 4 million female garment workers, each earning less than $4 per day. Most don't have college degrees and many work in unsafe conditions, as evidenced by the 2013 Rana Plaza factory collapse that killed over 1000 garment workers in a single day. With your help, these women can get an education, break out of poverty, and improve the garment industry from the inside. This project will help one female garment worker earn her Bachelor's degree and develop the professional skills needed to advance her career and lift her family out of poverty. 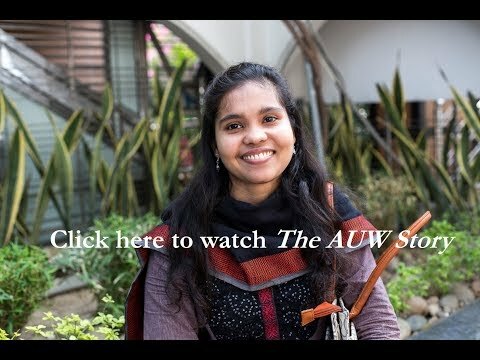 With your help, she will get an English language-based, liberal arts and sciences undergraduate education at AUW's multicultural residential campus in Bangladesh. She will combine her education and experience working on the factory floor to advocate for others, and improve her life and the lives of those in her community. Our mission rests on the unshakable belief that poverty, discrimination, war, and restrictive social norms should not exclude women of great promise and courage from educational opportunities. By investing in one female garment worker, you will not only change her life; you will change the fate of her children, her community, the planet, and the entire garment industry. The student you support will become an agent of change. Your investment will impact millions of people in a single lifetime.